Microsoft just released SCCM Configmgr Current Branch 1806 as in-console update for first wave customers (opt-in) which means ,you can run PowerShell script to get this update in your console . This build can be applied to your Configmgr sites running on 1706 ,17010 and 1802 . This build version is not available as standalone media (baseline) hence you you can download latest baseline media which is 1802 for new installation and then apply 1806 as in-console update. With this build 1806 ,there some exciting features and improvements . 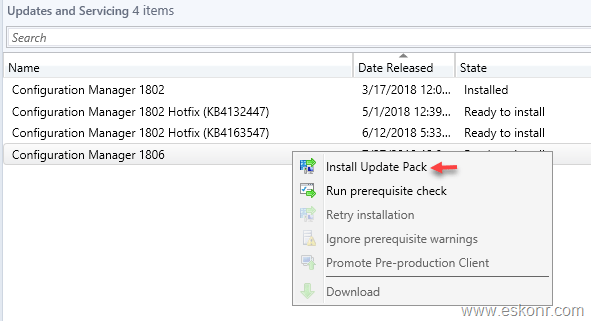 If you are already using SCCM Configmgr technical preview builds in your lab ,you wont be surprised with 1806 features as most of them are already in the preview builds and there are some improvements from its previous current branch builds. 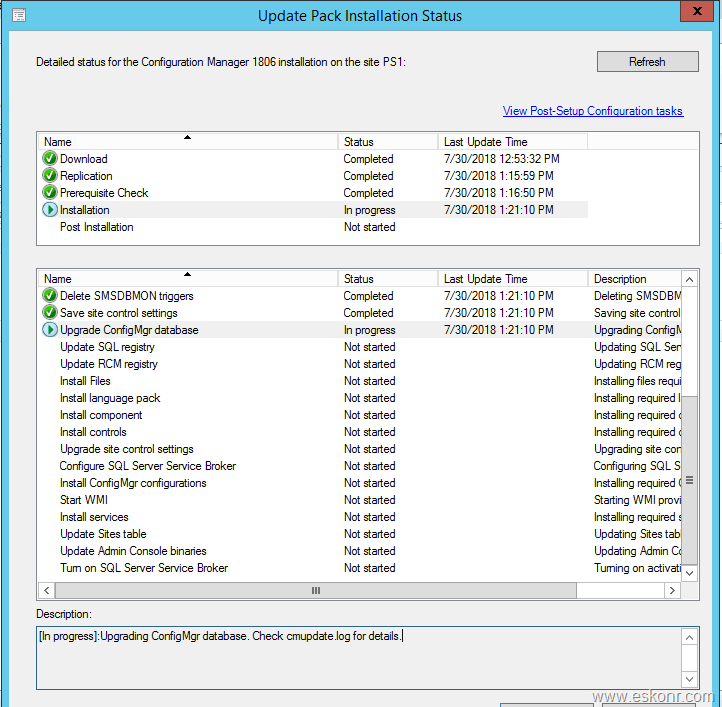 6.Third party software updates –You can now subscribe to partner catalogs in SCCM console and publish to WSUS. 8. 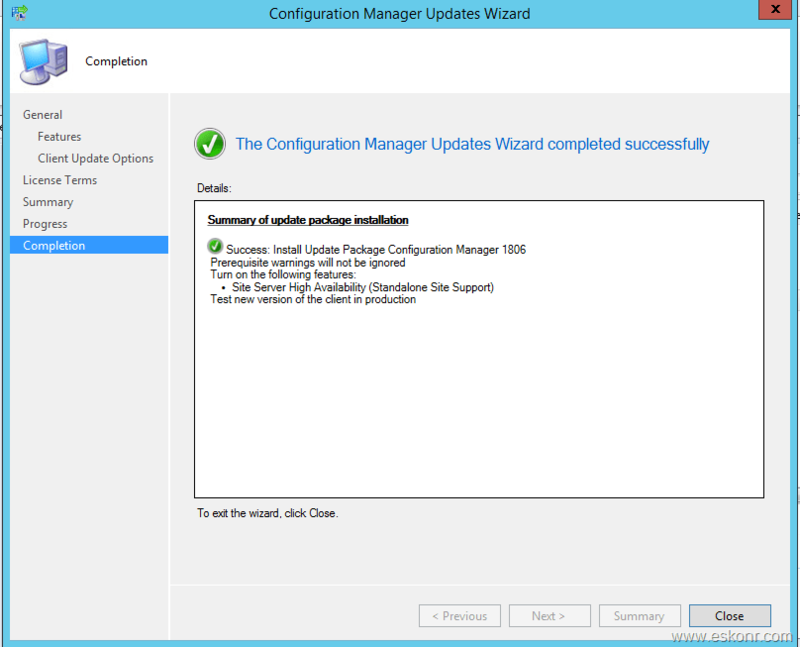 WSUS cleanup wizard declines updates that are expired as per the supersedence rules. 10. Hardware inventory limit increased to 18,446,744,073,709,551,616 (2^64). 11. Hardware inventory default unit conversion is now back to MB so change your custom reports if you have any for inventory data. If you are on build ,1706,1710 and 1802 ,you will not see this update for now as this is released only for first wave customers which means ,customers who want to try this ,they can run the PowerShell script (opt-in) to see it in the console. 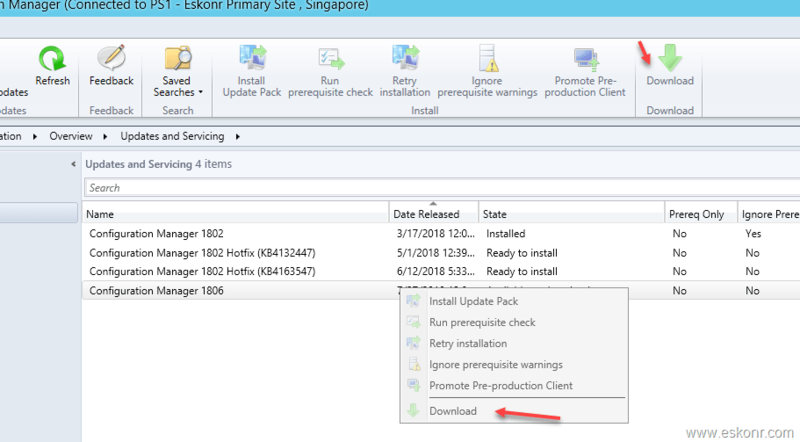 As the update is rolled out globally in the coming weeks, it will be automatically downloaded, and you will be notified when it is ready to install from the “Updates and Servicing” node in your Configuration Manager console. If you can’t wait to try these new features, this PowerShell script can be used to ensure that you are in the first wave of customers getting the update. By running this script, you will see the update available in your console right away. Download the script and extract it .Open the PowerShell command as admin and run the script . it will ask for SCCM site server, give the name. Once the script run successfully ,Go to Administration –>Overview ,updates and servicing ,Click on check for updates and refresh the node . At this point ,check dmpdownloader.log ,you will some progress about the new update. I browse the URL that failed to connect ,it works fine so I have to re-download the content again. I went to console again ,if I can retry the download but the download option is grayed out . If you get any errors like WARNING: The F:\ConfigMgr\EasySetupPayload\5b823327-92d9-4908-a24c-8d8c6625f407.cab signature could not be verified then download the cab file manually and place it in EasySetupPayload folder. Now try to extract the cab file using 7zip or other unzip tools and place the content into F:\ConfigMgr\EasySetupPayload\5b823327-92d9-4908-a24c-8d8c6625f407 folder and restart the DMP downloader service. Click next next next ( unless you have any need to select the features included in the pack. Later also you can choose to enable these features.) and choose pre-production collection for client upgrade . after a while ,if you click on the console (refresh) you will see that ,there is new version of console to be upgraded . Click ok to get the console upgraded. In the next blog post, I will cover some of the existing features released in this build.